Here's How You Can Have A Gorgeous Natural Look Effortlessly! Now you can boost your self-esteem and regain your lost confidence by choosing our hand-made 13*6 inch kanekalon FUTURA synthetic hair wig, which will allow you to give your hair a natural, realistic and beautiful look! Since our women's wig is made of superior-quality, kanekalon FUTURA synthetic hair, that is the most preferred brand of Modacrylic hair worldwide., you can easily style and experiment with different hairstyles and looks without worrying about any damage! REGAIN YOUR LOST CONFIDENCE IN UNPARALLELED STYLE - Now you don't have to struggle with hair loss or thinning hair anymore! The FUHSI premium 13×6 lace front wig medium size(22.5") is here to help your look stunning and give your self- esteem that much needed boost! 100% REAL KANEKALON HAIR FOR A NATURAL LOOK - Made of 100% superior- quality kanekalon Futura, that is the most preferred brand of Modacrylic hair worldwide. Futura can be styled with curling irons and other heat tools up to 377˚F, our wig is not only soft and shiny, but also tangle-free and shed-resistant! FEEL BEAUTIFUL AGAIN WITH YOUR STUNNING BLONDE HAIR - Chosen by thousands of women all over the world, the FUHSI KANEKALON synthetic wig will allow you to customize it according to your style and use all your favorite hair care products without any worries! NOBODY WILL KNOW YOUR BEAUTY SECRET - Unlike other synthetic or low- quality human hair wigs that never seem to stay in place, the FUHSI exclusive real hair women's wig features skin-safe elastic straps that are ultra- secure and invisible, so you don't have to fidget and readjust your hairpiece all the time. 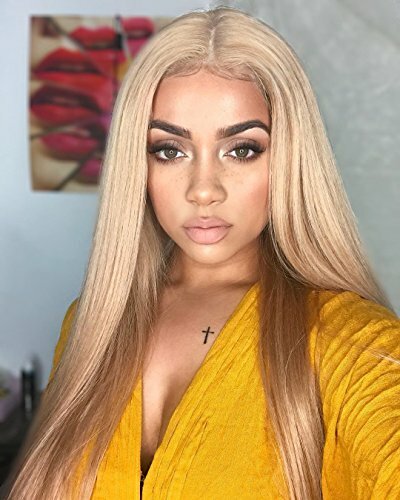 100% STYLISH & BEAUTIFUL HAIR OR YOUR MONEY BACK - We take great pride in providing you with the highest- quality similar as real human hair wigs, that's why we back our lace front women's wig with our unconditional 15-day full money back guarantee! Now you can look and feel beautiful 100% risk-free! If you have any questions about this product by FUHSI, contact us by completing and submitting the form below. If you are looking for a specif part number, please include it with your message.